These books are dense, filled with many characters and crossing story lines, but I’m totally hooked. A Song of Ice and Fire (known some by as the A Game of Thrones series) by George R.R. Martin is one of my favorites. I’ll be honest; while reading the first book I wasn’t sure I wanted to continue. The size and complexity can be daunting and I had a hard time keeping up with the range of characters and how quickly the scenes switched between each, but as I’ve gotten more involved in the story, the more I enjoy it. Martin has done an excellent job of creating a range of characters that readers love and hate, because a good story must have both. His complex plot twists completely blow me away and I find my jaw dropping at the way he can ruthlessly kill off characters without warning. I have my favorites (Tyrion Lannister, Jon Snow, and Daenerys Targaryen) and on the other hand, the characters that I can’t stand including Cersei and Joffrey Lannister along with the sketchy Petyr Baelish. Taking a turn away from the books, I also watch the TV series A Game of Thrones. While I prefer the books and the depth with which they go into, I do think that the show has done a good job bringing the story alive and spreading it to a wider audience. 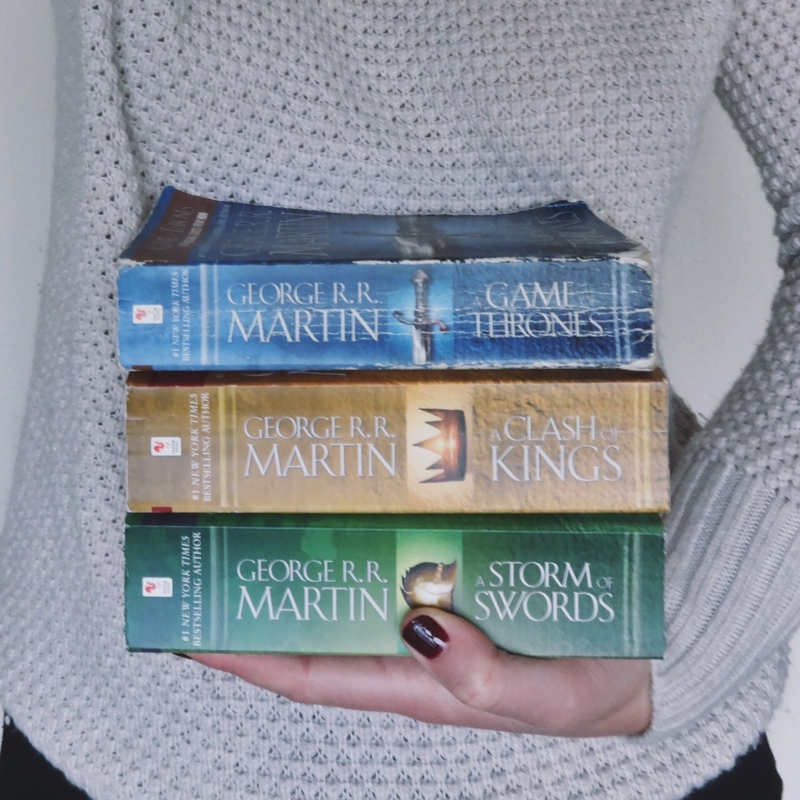 If you have a chance to start A Song of Ice and Fire, I really recommend it. Even though it might not seem like it, the story moves beyond the confusion and definitely gets into the good stuff! When I read, and enjoy, a book over 1000 pages, you know it must be good! I love this series! I also watch the show and thought they did pretty good with everything until this past season when they completely destroyed the story. Really disappointing. And totally unnecessary. I’m eagerly waiting for the next book – really looking forward to where Martin takes us. I totally agree! I don’t like all the changes they have made in the show this last season, but I’m so excited for the next book to come out! I love the whole series! And I think the plot just gets better the further in you get. I’m conflicted over the TV series too, but I’ve learnt to see them as separate from each other. I’m hoping that they’re just taking different routes towards the same end? Either way I can’t wait to find out what happens next! I shall look into these soon I think. I definitely agree about the series. I attempted to watch it but it was SO slow and that’s saying something with each book being an absolute tome! I was so glad I read this series, instead of being intimidated by the size of them! We have the same favourite characters, apart from I like Arya too 🙂 I haven’t see many people talk about the ASOIAF series on here so I’m glad to have seen this! Oh I like Arya too! I’m just frustrated with her character at this point because I feel like she isn’t doing anything worthwhile… It surprises me that there aren’t many posts on the series because it’s so good! Yea there were parts of season 5 that I loved and parts I really didn’t like! I’ll just have to find time to watch and find out! How long would you say it took to read this? I’ve wanted to read this series for awhile, but feel I have to prepare myself for the size. Depending on my schedule it can take me over a week to read one book, so I’m thinking whenever I read this, I’ll probably only get to read 1-3 books in the month. Yea I think you’re right. They are dense and detailed so it definitely took me longer than the average book, but t was totally worth it! It’s definitely a great series to read! I hope you do! I can’t wait to start this series! I plan on reading it in the new year! Happy to hear you recommend it. It’s very dense, but once you get into its so addicting!! I’m a lil scared about he size, but soooo excited to start! Have wanted to read it for a while. They are definitely huge, but totally worth it! Plus finishing books that large are quite an accomplishment!